I also appreciate the art of Elmore contemporary Clyde Caldwell! Those of us who played AD&D back in the late 80's and early 90's surely remember the illo above! 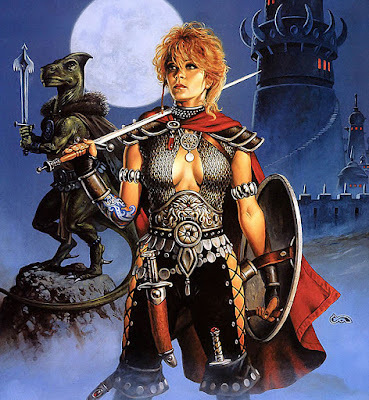 The lady in the foreground with the impractical armor is Alias, the protagonist of the Forgotten Realms novel Azure Bonds (and the module Curse of the Azure Bonds). In the background is her friend...Dragonbait! Ah, the good old days!